A leading Indian artist has said he was "stupefied and outraged" to find that many of his paintings at a show he was inaugurating were fakes. SH Raza was inaugurating the exhibition at an art gallery in Delhi. The Dhoomimal Art Gallery closed its show as soon as Mr Raza pointed out the fakes but said it had sourced them from the painter's family. There is a flourishing market for fakes of most leading painters in India, art gallery owners and experts say. The gallery was hosting an exhibition of Mr Raza's work, which was to run till the end of the month. Mr Raza, 86, said when he reached the exhibition on Saturday, he found that a number of the paintings were fake. "At this stage of my life, this was the last thing I wanted to do - grace an exhibition of my own fake paintings. I am so upset and cannot get over it," Mr Raza wrote in the Mail Today newspaper. He said he had been advised by his friends to take legal action, but he had not decided. "This shows Indian art in a very poor light. We need to find out how this happened," Mr Raza wrote. The owner of the 70-year-old gallery, Uma Ravi Jain, told the BBC that Mr Raza's paintings for the exhibition were sourced from the painter's nephew. Only two of the 30-odd paintings which were being displayed were from the gallery's own collection, she said. "The rest came from Mr Raza's family, so we did not suspect they were fakes. This is the first time we've had such an experience," Ms Jain said. 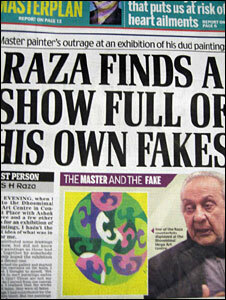 One of Mr Raza's friends, who accompanied him to the exhibition, said the paintings were obviously wrong. "If you have an original and you make a copy, you still retain the style of the artist. But when you make something totally unrelated to what the artist is known for and then pass it off under his signature, it is actually an original fake," writer Ashok Vajpayee told Mail Today. Mr Raza, whose paintings have sold in leading galleries around the world for record amounts, lives and works in France these days. The owner of the gallery admitted that fakes had become a big problem in India's growing art industry. "There are a lot of fakes moving around in the market. They have become a big problem," said Ms Jain.